On our definitive ranking of french fries, curly fries are way up there. (Sorry to say, anyone who disagrees is wrong.) Here, we have an easy recipe for baked curly fries that just may convince any naysayers. 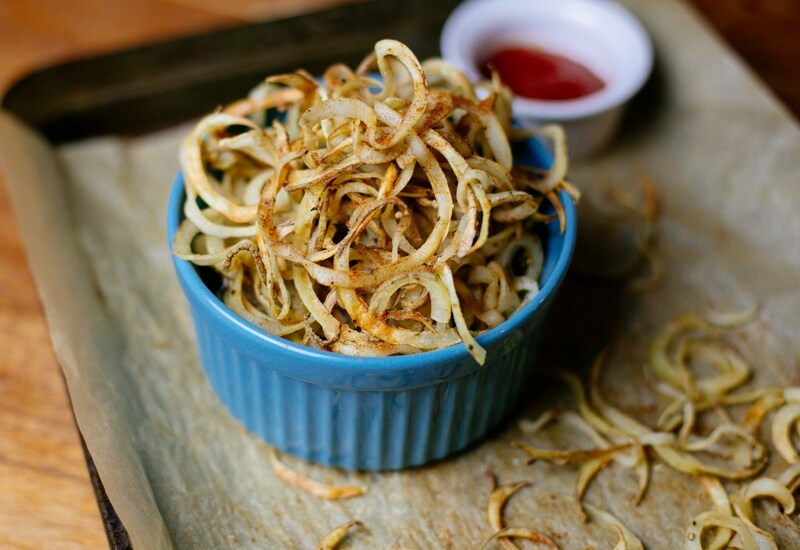 It's simple to get the iconic curly shape with a spiralizer. This beats cutting potatoes with a knife any day. As for what makes the curly fries so good? We think it's the seasoning. We're replicated the classic taste of curly fries with a mix of cayenne, onion powder, and smoked paprika. We also have a recipe for curly sweet potato fries, if that's your bag. You can prep the potatoes ahead to cook later so you can serve the fries nice and hot. But if you don't want them to turn yucky brown, keep them submerged in water till you're ready to use them. Per Serving: 183 calories; 11g fat; 20.6g carbohydrates; 3g protein; 0mg cholesterol; 305mg sodium. This was the first recipe I made with my new spiralizer. I set the first batch down while I went to get the meat off the grill. When I returned, my wife and father-in-law had polished the entire batch off, which led to the unplanned second batch. I ate some right off the pan before offering to the others because I didn't want to miss. They were pretty darned good! Simple to make and very tasty. I actually put these on my burger (as I am a put fries inside your burger kind of gal). Great, healthier alternative to french fries. I added more cayenne for a bit of a kick and served the rest not in burger with some Sriracha mayonnaise.